Have you ever let anger get the best of you? It’s not always easy to stay calm and controlled when we’re upset. For customers, strong negative feelings can sometimes lead to abusive behaviour. This is behaviour far beyond anger, frustration or difficulty, and it’s not okay. But how can you deal with it? Abuse is ongoing, unpleasant, and often used to demean or control. It consists of harassment, hate speech, constant swearing and personally charged insults, comments and threats. It’s demoralising and stressful for customer service agents. Plus, until the abuse stops, it’s impossible to help the customer with their problem. Dealing with customer abuse is unpleasant, but sometimes unavoidable. So, here are three ways to deal with abusive customers. The idea behind the three-strike rule is that the customer is given two opportunities to correct their behaviour before the support session is terminated. The first strike is phrased as a polite request. You aren’t warning the customer, you’re alerting them to the fact that their behaviour is unacceptable. Sometimes customers don’t notice their behaviour is abusive. They might be stressed or frustrated, or not realise the impact they’re having on you. By politely alerting them to the issue, you give them a chance to self-regulate. For many customers, the first strike is often the last. If your polite request goes ignored, issue strike two — a formal warning. In this case, you are not asking the customer to stop, you are warning them of what will happen if they don’t. Make clear the consequences of continuing to be abusive and tell them to stop. Strike two is more assertive than strike one, but you must also remain polite and calm. Remember, it’s a warning, not an opportunity to retaliate. Most customer abuse will have dissipated before strike three. If the abuse does continue after your formal warning, it’s time to disengage from the session. After all, you’ve given the customer ample opportunity to correct their behaviour. Disengaging isn’t as simple as just hanging up the phone, disconnecting the chat session or ignoring the email and moving on. You must first inform the customer that you are ending the session. Be sure to reinforce why the session is ending, and invite them to contact support once they have calmed down. 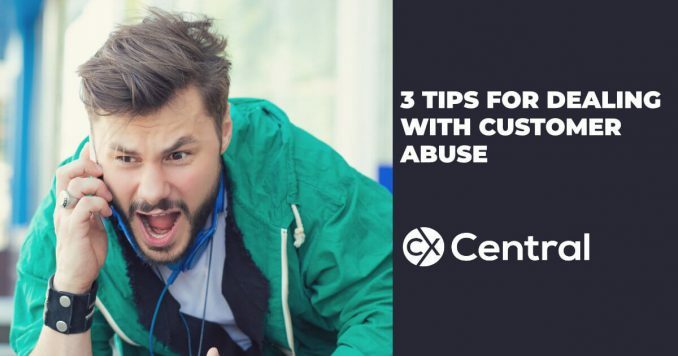 While the three-strike rule can be effective for single instances of customer abuse, customers that are frequently or consistently abusive need a different tactic. For repeat offenders, it can help to control which channels they can use to reach you. Some contact channels are, unfortunately, more prone to abuse than others. For example, the long process of email support encourages the customer to read through and review what they are saying before they hit send. Meanwhile, real-time support (while an important feather in your cap) can see customers much less likely to regulate what they say. While there are tools to help you deal with abusive customers in most real-time support channels, sometimes a more drastic action is needed. Restricting an abusive customer to email support, for example, can send the message that they’ve behaved poorly, without fully closing the door on them. Plus, this creates longer response times, allowing your customer to calm down between messages. Choosing to restrict the channel options for an abusive customer doesn’t mean just blocking or blacklisting them and forgetting about it. You should inform them of the decision to restrict their support access and politely explain why, before you restrict their contact options. If a customer continues to engage in abusive behaviour regardless of any attempt to stop them, you may need to consider letting them go. Firing a customer is the last resort, a worst-case scenario, and is not to be taken lightly. Firing a customer should be reserved for customers with a history of abusive and unpleasant behaviour. Even when you’re firing the abusive customer, you should not be using it as an opportunity to be abusive or rude to them. Politely explain what is happening and keep your reasons clear and supported with evidence. It can also be a good idea to refund all or part of the customer’s purchase. This provides closure to the customer and can also demonstrate that you value your team. No one deserves to feel unsafe at work, and when you prioritise your team over an abusive customer, it helps morale as much as it deals with the customer abuse. Remember: you can’t solve the problem while the customer is being abusive. You need to deal with the behaviour first and fix their problem second. No matter the reason for the abuse, everyone deserves to feel safe at work. So, when customer abuse rears its head, it’s important to have strategies in place to manage it. When dealing with customer abuse — no matter which tactic or method you choose to use — there’s one golden rule that always applies. Always be polite, and never react in kind. Search our Events Calendar for upcoming training courses, networking events, conferences and more.